Time for the community organizers to step up to the plate and form citizen patrols. As Chicago struggles with a growing violence problem, the head of the police union is telling his members to avoid overtime for the Labor Day weekend. It is turning into a war of words between the powerful police union president and one of Chicago’s most respected religious leaders, and it all comes on the heels of Chicago recording its 492nd homicide of the year, more than New York and Los Angeles combined. 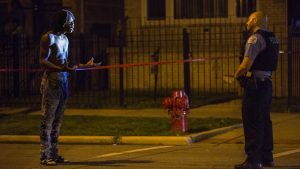 Chicago has already surpassed the total number of homicides from last year, having just ended the bloodiest August in nearly two decades. As the city approaches the long labor day weekend, the president of the Fraternal Order of Police is urging rank-and-file cops to decline overtime. “They`ve been stretched pretty thin, so this is the last weekend they can have with their children, so what we decided to do is just say take a weekend off, don`t work those extra days,” said Dean Angelo. The call enraged Father Michael Pfleger, who staged an anti-violence march in the troubled Auburn-Gresham neighborhood Wednesday. “Go to hell! Go to hell, Angelo! How dare you tell police to not do overtime and make our streets less safe,” Pfleger told the crowd of protesters.